Nepenthes X mastersiana is an old Vitctorian hybrid between N. sanguinea and N. khasiana. I first became aware of this hybrid while visiting the website Plants With Attitude. Ever since then I've been searching for that hybrid. I located many growers with this hybrid, but none of them had any cuttings. I was told that this hybrid didn't put out many basals or cuttings were difficult to root. Something to that effect because the plants were just unavailable. So I was frustrated because the plant was obvious around, but I just couldn't find anyone with a rooted cutting. Finally I got an email from another grower telling me he had bought one from Botanique and maybe they had another. And luckily they did! I later was able to get a rooted cutting from Tristan's. I don't know if the Botanique clone and Tristan's are in fact from the same plant. Both parents of this hybrid are commonly available so crosses being called N. X mastersiana are floating around out there that may not be the real N. X mastersiana. I've seen some maroon ones that might have been from a dark red N. sanguinea. Because N. sanguinea has many color forms, I suppose there will be many variations of this hybrid. I was told that this is the real N. X mastersiana and not a "remake." I don't really know why I like this hybrid so much but I do. I like the lid and peristome that is heavily influenced from N. khasiana. I have another N. khasiana hybrid involving N. truncata that has a similar lid and peristome. From all accounts this plant should be huge. 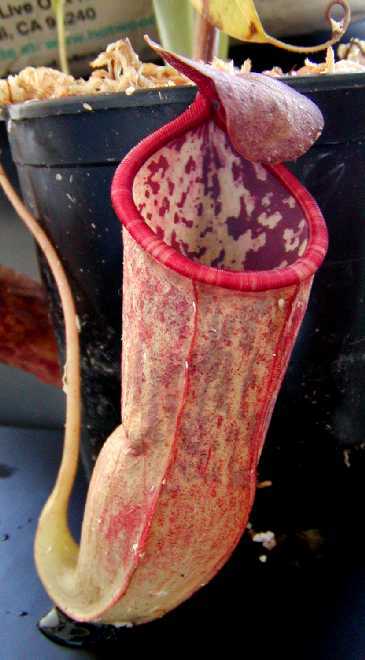 I have a N. sanguinea that produces some of the biggest pitchers in my collection so I look forward to growing this specimen out.